10-20 per cent of spinal surgery patients will experience one or more complications from their surgery. These complications are intimately tied to the specifics of their surgery, their underlying pathology, surgical approach, and the devices or instrumentation utilized. Further complicating matters are the bewildering array of hardware that is utilized to treat spine disease, with new approaches constantly becoming available. The goal of "Specialty Imaging: Postoperative Spine" is to provide a broad overview of the role of advanced imaging for the diagnosis and management of the postoperative spine patient. 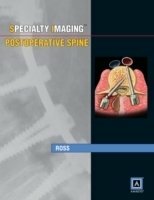 Thus this book covers normal (preoperative) spine anatomy, gives brief synopses of common surgical approaches, and covers the appearance of the normal postoperative state. Emphasis is given to the imaging and diagnosis of local spine and adjacent soft tissue postoperative complications, as well as remote complications and general medical complications. This is not a surgical textbook. The surgical descriptions are purposely superficial, and geared toward radiologists who want a general understanding of the clinical rationale for the surgery and the surgical approach. This book is intended for practicing radiologists, residents, fellows, and anyone who treats postoperative spine patients.